Home » » Suspected Cultist beat Rival member to death. 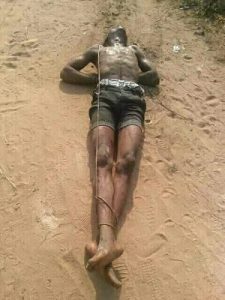 Suspected Cultist beat Rival member to death. A member of Eye cult group was killed by rival Bagger cult group in Sapele, Delta State. The victim was said to have been ambushed by members of the Bagger gang at a jungle where they smoke weed. According to reports, he greeted them and they immediately grabbed him. There have been clashes between the Eye and Bagger cult groups which has led to loss of lives and properties.